The psoas muscle! Ever hear of it? Most of the people I see in our clinic have never heard of it and yet it is the most important muscle in the body. 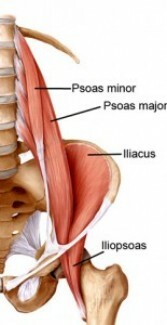 Also known as the hip flexor muscle, it joins with the iliacus muscle to form the iliopsoas. This muscle is the only muscle that attaches/connects the upper, middle and lower body. For a quick anatomy lesson, it starts at the lumbar vertebrae, goes down on top of and attaches to the inner bowl of the pelvis, then crosses over the top of the thigh bone (femur) and attaches to the inner thigh. It often does two jobs, one on each side of the body, as it helps stabilize the standing leg while also initiates the swing of the opposite leg while walking. It is the lead domino and as the lead domino goes, so go the other dominoes. Many of us have become so sedentary that our hip flexors lose function and shut down. The hip flexor can and will get too tight, too lose, too weak, too strong or some combination of these traits. It becomes short and weak as we sit for long periods of time. Then, when we try to make up for lost time and get in a little movement or exercise –our back flares up, neck starts hurting or we get knee pain. Maybe we get a case of hip bursitis or plantar fasciitis. It doesn’t matter what the symptom is or what the diagnosis is, the culprit is our lack of hip flexor function. So, it’s not your back or knee or foot or neck. Those are just symptoms. We have to get to the cause to alleviate the symptoms and more often than not the cause is that your iliopsoas has shut down. Because it attaches to the lumbar vertebrae, the spine and upper body are affected. It attaches to the pelvis so the hip joint can be affected. It attaches to the top of the thigh bone so the lower body can be affected. The psoas is really the most important muscle of the body. Remember the domino analogy. The body is an inter-related system so the site of the pain is rarely the source or cause of the pain. If you are experiencing back pain or neck pain or any other symptom, come let us take a look at you and help you regain your function…and get those hip flexors working!